Smalls Jazz Club is a unique entity on the landscape of jazz clubs, offering a little something extra to us jazz fans. Something that most clubs, in this day and age, should be doing already, to promote the massive talent that is out there. The little New York club was founded in 1994 by Mitch Borden, a philosopher and violinist, wanting to provide a space for musicians which was conducive to Jazz Music and its culture. It prides itself on featuring cutting-edge music and often hosts after-hours performances. The jazz cats all come out to play at this place, being open everyday until the sun comes up, it’s perfect. Spike Wilner, a jazz pianist himself, partnered with Mitch in 2007 after a closure of five years. They restored it to its former vibe, atmosphere and began to create an archive of everyone who played there. It has its own record label, Smalls Live, and for a place that only seats 60, has the whole world as it’s audience. It live streams all of it shows over the internet for everyone to enjoy. They have a vast archive, spanning almost five years of nightly performances. From what we hear, this is one of the best jazz clubs in New York. 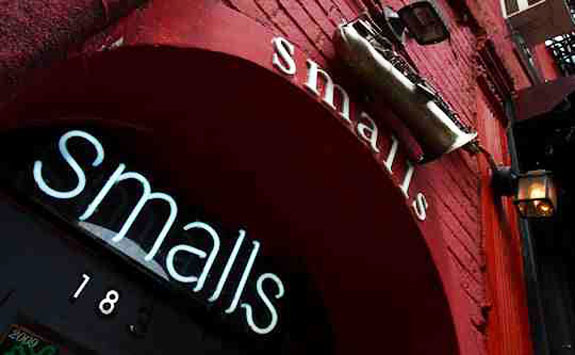 Looking forward to reviewing Smalls Jazz Club in full when the Jury is out in New York. INFO: The club is open from 7.30pm to 4am, everyday. Cover charge of $20 and you can stay as long you like.